The sixth edition of State of the Evidence by Janet Gray, Ph.D. appeared in October 2010, with an all-new advocacy section, From Science to Action, by Janet Nudelman M.A. and Connie Engel, Ph.D. The Breast Cancer Fund’s landmark report summarizes and evaluates the scientific evidence linking exposures to chemicals and radiation in our everyday environments to increased breast cancer risk. It also links the science to actions everyone can take to reduce the risk. Dr. Gray was in Toronto in November 2010 to speak at the Breast Fest Film Festival, the world’s only film festival dedicated to breast cancer awareness and education. In her talk which followed a screening of Living Downstream, the new documentary about Sandra Steingraber (which has been previously reviewed in An Ounce), she spoke about the most up to date information about carcinogenic pollutants and the work being done to eliminate these substances. 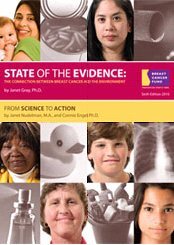 State of the Evidence 2010 presents a comprehensive summary of the scientific data on the environmental causes of breast cancer. The report catalogues the growing – and increasingly alarming – evidence linking breast cancer to, among other factors, synthetic hormones in pharmaceuticals, cosmetics and meat; pesticides in food; solvents in household cleaning products; bisphenol A (BPA) in food containers; flame retardants in furniture; and radiation from medical treatments. The report also highlights impacts on the most vulnerable populations (including infants, pregnant women, African-American women and workers), and outlines the policy initiatives required to develop a national breast cancer prevention plan. The report states that a woman’s lifetime risk of breast cancer is 1 in 8—representing a dramatic increase since the 1930s, when the first reliable cancer incidence data were established. Between 1973 and 1998 alone, breast cancer incidence rates in the United States increased by more than 40 percent. Strikingly, the increasing incidence of breast cancer since the 1930s parallels the proliferation of synthetic chemicals. Today, approximately 85,000 synthetic chemicals are registered for use in the United States, more than 90 percent of which have never been tested for their effects on human health. This report comes just months after the President’s Cancer Panel’s report, Reducing Environmental Cancer Risk: What We Can Do Now, whose lead authors, Margaret Kripke, Ph.D., and LaSalle Leffall, Jr., M.D., found that the true burden of environmentally induced cancer has been grossly underestimated. The report leveled a hefty critique of failed regulation, undue industry influence, and inadequate research and funding. It also found that the US government has been locked in a cancer-fighting paradigm that has failed to look at the complexity of cancer causation and, in so doing, has missed the opportunity to create a national campaign for cancer prevention. The situation in Canada is no different. We live in a toxic world. In the report, Dr. Gray writes that, of the 85,000 chemicals in use in the U.S. today, just 7 percent have been evaluated for safety. And included in that 7 percent are 216 chemicals that international regulatory agencies have associated with breast cancer. “No one study and no one chemical by itself is the critical linchpin in saying that environmental exposure to chemicals is associated with breast cancer,” she says. “Our growing understanding is that these chemicals are interfering with hormones and altering breast development in ways that are very similar to what DES did in the 1950s and 60s,” she adds, referring to diethylstilbestrol, a drug many women took to prevent miscarriages. It was later found to significantly increase breast cancer rates in the women, their daughters and, new research suggests, even their granddaughters. Rodale publishes some of the best-known health and wellness lifestyle magazines, including Prevention, Women’s Health, Running Times, and Organic Gardening, as well as books on health, fitness, cooking, gardening, spirituality, nature, the environment and more. In their review of State of the Evidence, they point out that, “Nobody can avoid all of the dangerous chemicals in our environment, but there are steps you can take to shield yourself from some of the toxins you encounter every day.” And they provide some easy ways to protect yourself and your family from the cancer-causing influences of modern chemistry. We’ve heard these before and a reminder always helps! Eat organic. Organic produce, meat, and dairy products are free of the growth hormones in milk, pharmaceuticals used on animals, and the pesticides on our food (such as the widely used pesticide atrazine) that have been linked to breast cancer. Use glass or stainless steel. Both are free of BPA and other plastic additives (such as phthalates) that are known to interfere with the endocrine system and possibly cause cancer. BPA is used in all canned foods, so opt for jars or cartons like the type used for soy milk and boxed soup instead, and store leftovers in glass or stainless steel containers. And whatever you do, NEVER microwave any food in plastic. Say “no” to vinyl. Shower curtains, flooring tiles, fake-leather bags and shoes, and children’s backpacks can all be made with vinyl, which itself is made with phthalates to keep the products made from it soft and pliable. Buy safer cosmetics. In the report, the Breast Cancer Fund identified nine commonly used chemicals that are believed to cause breast cancer, ranging from the phthalates used to keep nail polish flexible to placental extracts used in shampoos and other skin-care products to keep hair shiny and skin soft. Learn to make your own organic beauty products or consult the Environmental Working Group’s Skin Deep cosmetic-safety database for safer, over-the-counter goods. Avoid all synthetic fragrances. Whether found in your cleaning products or your cosmetics, synthetic fragrances contain a whole host of potentially cancer-causing ingredients, including phthalates and “synthetic musks.” Companies aren’t required to tell you what chemicals they use to make a fragrance, so opt for totally fragrance-free products or those scented only with essential oils. Use DIY cleaners and pesticides. An easy way to avoid unknown fragrances is to make your own cleaners and pesticides, both of which are often scented and both of which contain other non-fragrance ingredients linked to breast cancer. For tips, read our Nickel Pinchers tips on spring cleaning and DIY pest control. Toss your crumbling sofa. Flame retardants can make up as much as 5 percent of the foam in your furniture. Once the foam starts to crumble, there’s a higher chance that dangerous flame retardants can infiltrate your home. If you can’t afford to replace the furniture, cover it with a tightly woven barrier to reduce your exposure. Virtually everyone we know has been touched by breast cancer. And we need individual, corporate and government commitment to eliminating its environmental causes. For information about the Breast Cancer Fund click here. To hear Janet Gray’s discussion at the Breast Fest Film Festival 2010 click here. Michele Lalonde in Postmedia News. Landmark Report Links Breast Cancer to Everyday Chemicals. Breast Cancer Action Montreal’s “Toxic Twenty” list, ingredients it has identified as the most hazardous to health. To check a specific product or ingredient, check out the Environmental Working Group’s Skin Deep cosmetics safety database. This database rates ingredients or products from one to 10, with 10 being the most risky.